There is a section of the London Underground which has a short bit of track, and just a single train which shuttles between two stations at either end – and it isn’t the Waterloo and City line. I am referring to a tiny spur line on the Northern Line which links Finchley Central to Mill Hill East – and this weekend I wandered up to partly have a look at the line, but mainly as the track runs over a viaduct bridge which is reported to be the tallest on the entire tube network. On arriving at Finchley Central, I popped across the platform to the waiting shuttle train – which was surprisingly busy for a Saturday morning on what I presumed would be a quiet part of the network. 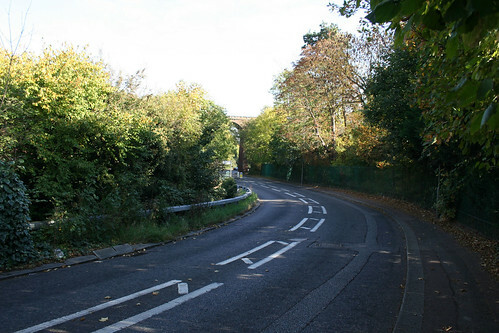 The trip to Mill Hill East goes over four bridges and initially you are at the same height as the houses before they suddenly drop away and you go over the viaduct. Alas, there are no grand views to gasp at as you go over the bridge, and a few minutes later you pull into Mill Hill East station. Despite being stuck on a tiny spur line, it lacks any quaint historic traits, being very much a modernised platform and cleaned up station building. Nice to see the modern fitments are available, but a bit of a shame that there is nothing cute to look at. The end of the track points directly at a private house – I wonder what it feels like to look out of your window and see a tube train heading directly for you? It is worth possibly noting a bit of history. 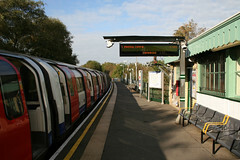 The first railway was the G.N.R.’s branch line from Finsbury Park to Edgware, which was opened in 1867 – andÂ Mill Hill East station was opened, as Mill Hill, in the same year. From 1868 trains ran from Edgware to Ludgate Hill and Loughborough Junction but in 1869 they were diverted to Moorgate; in 1872, with the building of the branch from Finchley to High Barnet, through services were withdrawn from the Edgware line and a shuttle service was instituted from Edgware to Finchley. A station was opened in Bunns Lane (later Mill Hill Broadway overland station) in 1906 but the line later suffered from road competition and was closed to passenger traffic in 1939. A proposal under the 1935-40 New Works Programme to link it to London Transport’s Underground system was not carried out in full; the eastern end of the branch, from Finchley Central to Mill Hill East, was electrified in 1941 to serve the near-by barracks, while frequent Underground trains began running to the west end of London, the City, and Morden over the Northern line. 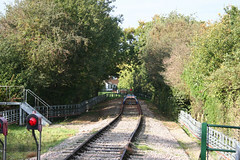 In 1970 the rest of the railway lay derelict, although looking at maps suggests that much of the original single track route is still there, covered in trees. 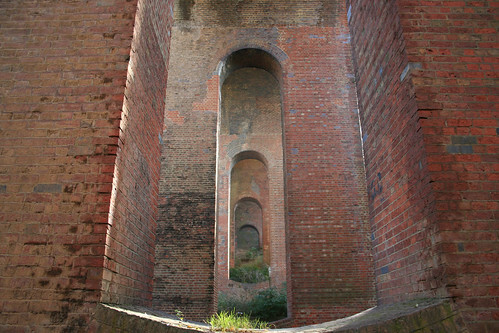 I decided to walk back from Mill Hill East towards Finchley station, so I could get to see the viaduct from a vastly more interesting location – underneath it. It’s a short walk along modern busy roads before you come to what is quite a rural looking bit of road (inc pavements on only one side) and yet also very busy – which makes taking photos sans cars in the view surprisingly difficult. There is a stream running under the viaduct, and I presume that if it was responsible for cutting the steep valley I was in – then it must have been significantly more vigorous in its youth. 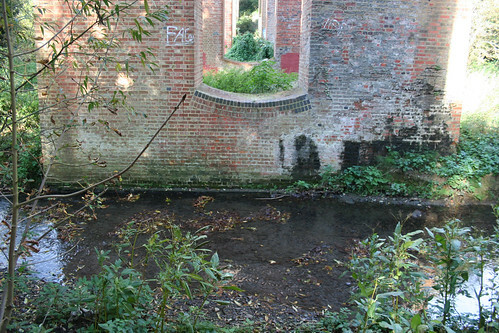 Curing round a corner, you can finally see the impressive 13 span viaduct in the distance – the Dollis Brook Viaduct – after the stream which runs under it. I spent some time taking loads of photos – and on one side the hillside is open and it was tempting to scramble up the hill to get some more photos, but I was less dressed for “scrambling in the undergrowth” and more for “meeting friend for lunch later”, so that plan had to be curtailed. 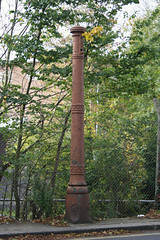 Having gone down a steep road to get to the viaduct, you have to go up an equally steep hill at the other end to get towards Finchley Central station – noticing on the route this rather sad bit of Victorian street lighting – probably an old gas lamp. There was also a side alley and I noticed that it had a footbridge which passed over the railway, so a quick stop there to get a view of the viaduct from above – although you can’t really see a lot from there thanks to the trees lining the route. Having spent an hour going up and down more often than the stockmarket has been wont to behave recently, it was not a surprise to see that my destination station was at the bottom of another slope. Maybe I shall go back one day in more appropriate clothing to see how much of the disused line is still walkable – as it seems to be part of the Northern Heights walk. 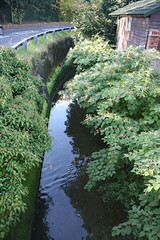 1 Pings/Trackbacks for "The Dollis Brook Viaduct"